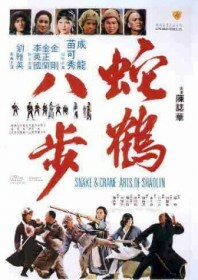 When the manual for the Eight Steps of the Snake and Crane disappears along with the Shaolin masters who created it, the martial arts world is thrown into disarray. Hsu (Jackie Chan), a pony-tailed wanderer (you know the sort), claims possession of the coveted book and summarily every goddamn scoundrel wants a piece of him. That’s more than enough to go on for this hearty chopsocky, its most redeeming features being a straight performance from Jackie Chan which is both convincing and unpretentious, plus some of his best traditional kung fu choreography. However, the movie still proved to be another flop for the Lo Wei Motion Picture Company.